We're concluding our live coverage of Julian Assange's arrest, but stay with CNN for the latest on the Wikileaks founder. This debate has spanned the decade: Is Julian Assange a villainous hack working in concert with countries that regularly squash a free press? Or is he a symbol of freedom of speech and the public's right to know? The debate is back on now that Assange has been arrested in the UK and charged in the US -- not under the Espionage Act for publishing classified material, as many press freedom advocates had feared, but under the Computer Fraud and Abuse Act. On Thursday morning, shortly after Assange was taken into custody, prosecutors alleged that Assange "engaged in a conspiracy with Chelsea Manning, a former intelligence analyst in the US Army, to assist Manning in cracking a password" on classified DOD computer systems. Notably, according to this timeline, Manning had already started to download information off the servers. Assange allegedly coaxed Manning to keep going. One of Assange's lawyers, Barry Pollack, says the charges just "boil down to encouraging a source to provide him information and taking efforts to protect the identify of that source. Journalists around the world should be deeply troubled by these unprecedented criminal charges." Ecuador's Foreign Minister José Valencia revealed more details about WikiLeaks founder Julian Assange’s behavior while he lived at the Ecuadorian Embassy in London. Valencia told lawmakers that Assange’s physical and mental health were "seriously declining" after living inside the Embassy for nearly seven years and that the prospect of keeping him at the embassy indefinitely would have increased the risk of his health deteriorating further. Valencia said Assange’s behavior was "aggressive" and he had "improper hygiene practices." Speaking to the country’s National Assembly today, Valencia said Assange had been riding scooters, playing soccer indoors and insulting embassy staff. He also said Assange was using loud speakers at 1:30 a.m.
Assange also tried to block security cameras inside the embassy and accused staff of spying on him on behalf of the US. He installed his own cameras and unauthorized equipment at the embassy. He was given a Wi-Fi password to use the internet, but he declined it. He was using a cell phone that was not registered with the embassy. Assange claimed he was kept in isolation, but he was receiving guests regularly -- friends, relatives, reporters and WikiLeaks staff, Valencia said. Assange also made false claims in his naturalization application documents, according to Valencia. Trump: "I know nothing about WikiLeaks"
President Trump, when asked if he still "loves" WikiLeaks, told reporters in the Oval Office that he knows "nothing about Wikileaks." "I know nothing about WikiLeaks. It’s not my thing, and I know there is something having to do with Julian Assange. I’ve been seeing what’s happened with Assange," Trump told reporters while meeting with South Korean President Moon Jae-in. Trump added that the determination will be made by Attorney General Barr. "I know nothing really about him," Trump said of Assange adding, "that’s not my deal in life." "I don’t really have an opinion," Trump asked when reporters continued to ask questions on Assange. President Trump has a history of supporting WikiLeaks before he was President, saying at one rally in 2016: "WikiLeaks, I love WikiLeaks." Senate Judiciary Chairman Lindsey Graham spoke this morning about President Trump repeatedly praising WikiLeaks, saying: "He's not an American citizen so he can’t be a traitor but I have absolutely no use for Julian Assange ... Whatever comes his way he deserves." Asked again if the President should have praised WikiLeaks, "That’s up to the President." Democratic Sen. Joe Manchin on Thursday celebrated the arrest of the Wikileaks founder, arguing it's "great for the American people." "We're going to extradite him. It will be really good to get him back on United States soil. So now he's our property and we can get the facts and truth from him," the West Virginia Democrat told CNN. Manchin, along with nine of his Democratic colleagues, had signed a letter to Vice President Mike Pence last June, expressing concern about Ecuador providing asylum to Assange since 2012. "I think it's very good for us to finally get him on US soil so we can investigate. We can basically cross-examine; we can find out the facts that only he knows and his connections and how he basically distributed his information," Manchin said. Sen. Roy Blunt, a member of Republican leadership who sits on the Senate Intelligence Committee, said this when asked about Trump’s repeated praise of WikiLeaks when he was a candidate. "Well I think anytime people are releasing information that shouldn’t be released that’s a troublesome thing, and I don’t have anything else to say beyond that." Ecuador's ex-President says the country's abandonment of Assange is "the biggest betrayal in Latin American history"
Ecuador's former president Rafael Correa said the revocation of Julian Assange's asylum is "incredible," in an interview with CNN's Richard Quest today. "It’s incredible. We cannot imagine something like this. It’s against international law; it’s against the institution of asylum; it’s against the Ecuadorian constitution, especially because since last year, Julian Assange has had Ecuadorian citizenship," Correa said. Correa was in power when Assange requested asylum. He told CNN he agreed to shelter the Australian WikiLeaks founder "not because we agree with what he did" but because "it was very clear that he didn’t have the opportunity to have a fair lawsuit, a fair process in the US." Correa laughed as Quest read out a list of Assange’s supposed violations as outlined by Ecuador’s President Lenin Moreno earlier Thursday. They are lies. They’re a justification for trying to justify this betrayal. It’s the biggest betrayal perhaps in Latin American history,” Correa said. Correa added that Moreno has never seen eye to eye with Assange since assuming the presidency in 2017. In addition to allowing UK police to enter the Ecuadorian embassy to arrest Assange, Ecuador also announced his citizenship had been suspended effective from Wednesday, according to foreign minister Jose Valencia at a press conference. How long did Assange spend in Ecuador's embassy? 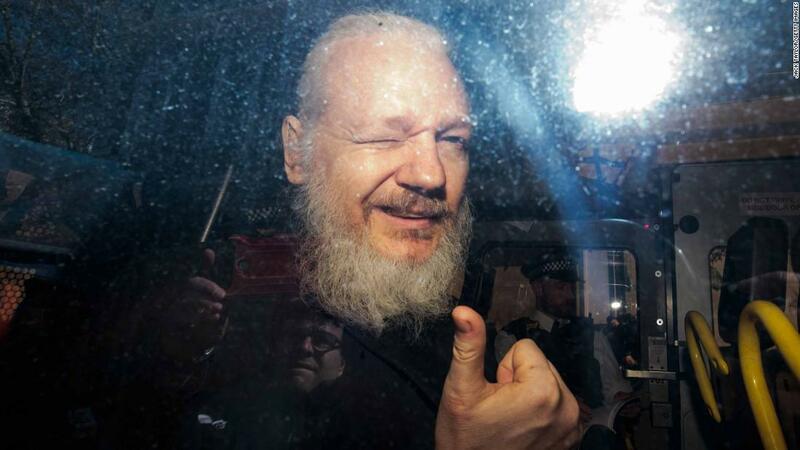 File photograph of Assange peering through the balcony window of the Ecuadorian embassy in central London on February 5, 2016. In case you're wondering WikiLeaks founder Julian Assange stayed in his self-imposed exile at Ecuador's London embassy for six years, nine months and 24 days. Or 2,488 days from start to end. He entered his diplomatic bolthole on June 19, 2012. Robinson added her client was formally notified his asylum would be revoked by the Ecuadorian Ambassador this morning.